Gardeners often find their passion when the kids fly the nest, the first house is purchased, or maybe at retirement. I was an odd child. I planted tree seedlings in the sandbox and collected seedheads while on the family vacation. I remember one Christmas when in addition to playdoh and matchbox cars I added bulbs to the list. Somehow Santa found a few wood hyacinth in December, and I was a happy kid when the presents were opened. My parents were the sensible type though, and although a lot of the lawn was turned over for flowers, they insisted I take it easy so that the yard wasn’t a complete burden when I moved on. They were right of course. The college years, first apartments, moving around to different states, all those other things in life that interfere with gardening happened, and it’s only now twenty something years later that I’m settled down enough to really have some fun. I can’t afford a fancy car-midlife crisis, but I can still swing a few overpriced snowdrops while also keeping the kid’s college funds intact. Here’s a treasure from Far Reaches Farm in Washington state. A friend tipped me off to a few snowdrops at this nursery (very reasonably priced for named snowdrops), and although shipping cross country during a polar vortex isn’t exactly normal plant buying procedure, I’m sitting fat and happy here, all hunkered down on the Pennsylvania tundra with my brand new galanthus “John Gray”. I also picked up ‘Blewbury Tart’. Maybe she’ll grow on me as the little tart clumps up but for now I’m still lukewarm to her small sideward facing congested bloom. Both of my new snowdrops show up on ‘best growing’ or ‘favorite snowdrop’ lists, so I’m pretty sure that even when they’re out in the garden among all the other snowdrops they should someday make me proud. Of course when shipping cross country it’s foolish to buy just two plants. Far better to fill the box, so I added two primrose plants. This one is primula vulgaris ssp. sibthorpii, an English type primrose that has a reputation for doing better through the dry, hot spells that other primrose generally don’t like here. The second (and third bonus!) primrose are in a cold garage corner (still dormant), but this one with it’s blooms already coming up goes right in to add to the winter garden! I loved my Far Reaches Farm order. Premium plants packed to perfection, communication was great, and the primula are so well grown they could even be divided now if I were so inclined. Just looking at their website today I could have easily filled another even larger order with cool arisameas and species roses…. 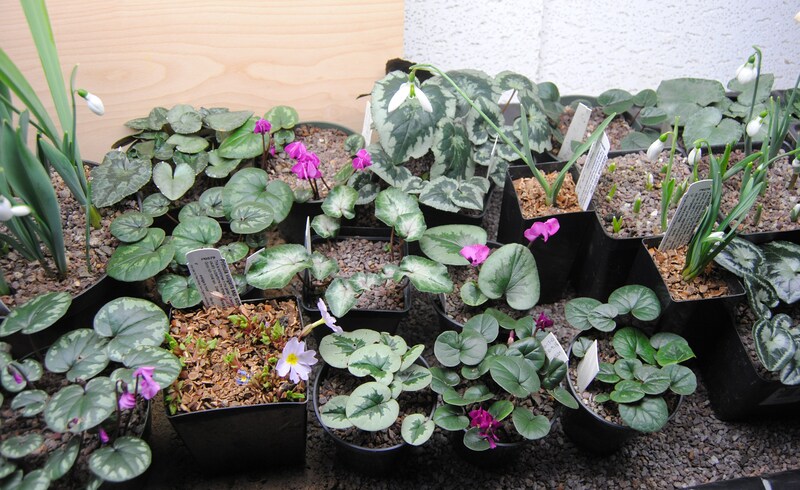 but I should really do a one month cool off period for any more new plant orders (the budget being blown as it is!) For now I’ll have to be satisfied with the winter garden…. for as long as it lasts…. the cold is creeping into the garage and the last polar plunge has pots in the corners of the garage frozen solid. All these exciting new treats make me wonder why I ever bothered to overwinter those tired old tender plants from last year! They only look marginally better this winter after having spent most of their time under the grow lights, and I think the trouble’s not worth it, so next year it’s back into the near dark of the garage. I know come May it will have been worth taking them in. Maybe if I’m bored during next week’s not-going-over-freezing weather I’ll repot the geraniums and start giving them a little water. It will be nice to have some summer flowers growing again, and they shouldn’t mind the cool garage temperatures at all. 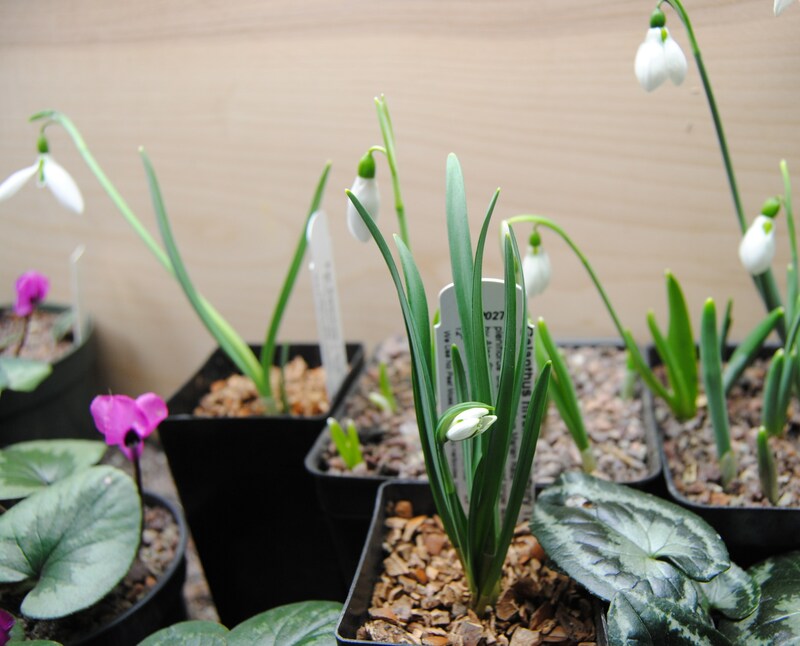 This entry was posted in growing under lights, snowdrops, Uncategorized, winter flowers and tagged far reaches farm, galanthus blewberry tart, galanthus john gray, growing under lights, overwintering geraniums, specialty perennials, winter flowers. But it is the cyclamen that are the stars. Intensely coloured flowers and great foliage, perfect. I go back and forth between the cyclamen and snowdrops for “favorite” status. Next year I may take in a few more cyclamen than snowdrops, for nearly two months they look awesome and how can I turn down more of that! Receiving a parcel of plants is like Christmas all over again, unwrapping each one and discovering the treasures within is a wonderful feeling. John Gray is a super snowdrop, he was my first named one, then all of a sudden he disappeared, just the label left, but I like him so much, another has been ordered. I’m so happy to hear that! I don’t have enough experience to know the good from the average so oftentimes I wonder if I’m cracking open the wallet for a good cause, but it sounds like for one of these at least, it was! So nice you finally have time to concentrate on your garden passion. Your indoor winter garden looks so satisfying. I haven’t even been out in the garden for at least a week or two (other than for the bird feeder) so the plants under cover are nice -even better now that it’s dropping below zero again! I have an order placed with Far Reaches, but it won’t be sent until mid-april. No cool indoor gardens here, just overflowing windowsills and a grow light stand. I would probably kill them with kindness if I got them this early. I have never understood the fascination with the genus Galanthus, they all look much too similar for me to get at all excited about. I dig up the ones that are taking over the gardens at Rocky Dale and plant them into my lawn. That is how I enjoy them. Do you approve of my primula choices? The other one is a primula x juliana ‘Jay-Jay’….. Your pictures over the last year have won me over and it’s only a matter of time before I’m starting my own avalanche of primula seedlings! 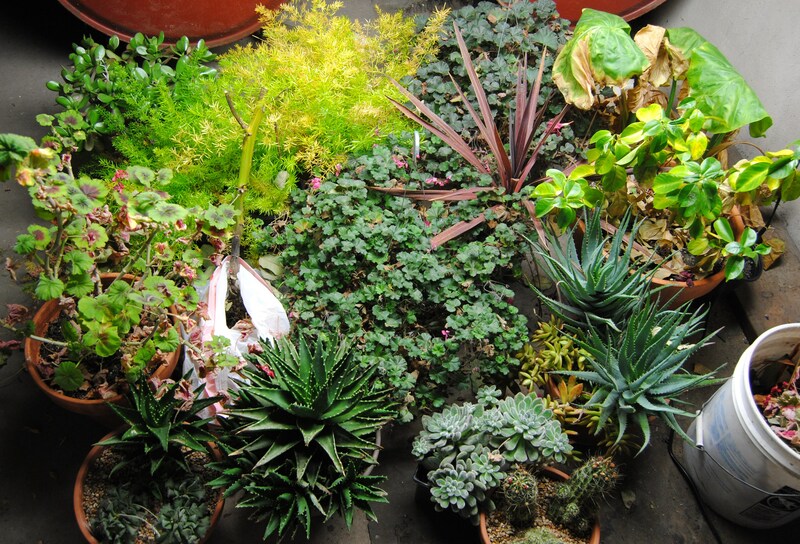 I’m not criticizing anyone for their choice of plant obsession…..I certainly have plenty of those. I need more of an obvious difference in flower form/color/shape/size to make me happy. Speaking of Primula seedlings….they are sprouting up now like lettuces! I didn’t take it at all as criticism, and you are not at all alone in your opinion! I’ve heard many snowdrop collectors say the same thing about too many names for too few distinctions. I wonder how people will judge my latest obsession of weed collecting… I’m waiting for my pink and white dandelions, my fancy thistles, and my purple leaved plantain seeds to sprout 🙂 My mother in law will be thrilled! John Grab is a super snowdrop and I love that little Primrose. It is so exciting getting parcels of plants. Are snowdrops very expensive over there? I’m glad you like the John Gray! Named snowdrops are much harder to find here and the prices are probably higher than what you see. I paid $20 (15 Euro?) and thought it was a good deal… (plus postage on top). I have never seen snowdrops for sale potted, and there are only maybe 3-4 varieties that ever show up dry in the fall. Two or three specialty nurseries offer them in the green, but sell out fast! But I sure don’t regret it yet! I am crazy for snow drops, and they come up at just the time of yer when there is not much else save for the witch hazels that demand any concentration. And so once you see a snow drop of another color, size or shape, it is quite astonishing! I have a friend who grows many many varieties and has been very generous with divisions. OF course, you always dig them and divide them and transplant “in the green” which can be iffy in our parts! Lucky you to have a friend who’s already into the drops. There are so many out there but it’s hard to even see them let alone get one or two of your own! Let’s hope snowdrop season isn’t too far off. Snowdrops are nice, but a bit too refined and elegant for me to get excited about. Give me Cyclamen or Crocus in bright colors! Glad you have good diversions for this long winter. Far Reaches is one of my very favorite nurseries. I got a number of winners from them last year. I think my favorite was Disporum longistylum ‘Night Heron’. Interesting the whole season long. I also tried Blueberry Tart and I’m still reserving judgement. I see myself getting into trouble with some of their offerings, I’ve been back to their website a couple times and there is always something I could easily convince myself to buy. ‘night heron’ is a plant I’ve heard mentioned a few times as a cool plant… Is it the color or just the plant in general? Just today I saw another picture of a clump of ‘Blewberry Tart’ and was second guessing my choice again…. I may have found my first ugly snowdrop.